As 2013 began, the Centre braced itself for a financially challenging year. We foresaw the need for significant investments to get our 2012-2016 strategy solidly under way. Furthermore, the ongoing financial and economic crisis cautioned us that changes might be at hand in our usual sources of donor support. Although substantial investments were indeed needed, fundraising fortunately kept pace. At year's end, we could gratefully say that in financial terms, the Centre rose to the challenge. Anticipating the difficult financial year ahead, our Board of Governors allowed us a €100,000 deficit to cover required investments. However, the Centre concluded the year with a much more limited shortfall of €32,000. This was, in large part, thanks to increased institutional support from some of our most trusted funders – the Netherlands, Belgium, Sweden and Finland – and the decision of the Austrian Government to join ECDPM as an institutional funder. 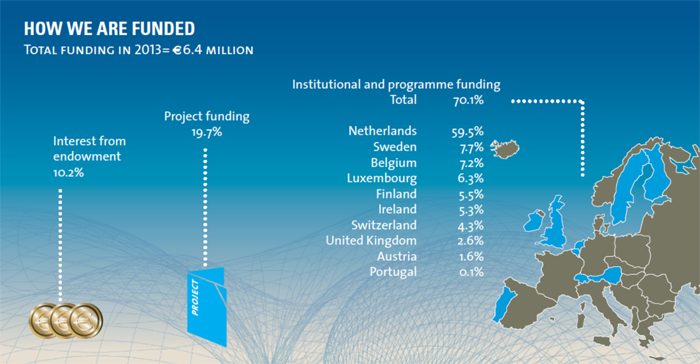 With a total increase of €668,000 institutional funding was higher than originally budgeted. Programme managers mobilised programme and project funding remarkably well, nearly reaching the target set for the year. This success in the face of austerity emphasises stakeholders’ appreciation of our work. It also represents an ongoing challenge and responsibility of the Centre: to continue to maintain the high standards set. 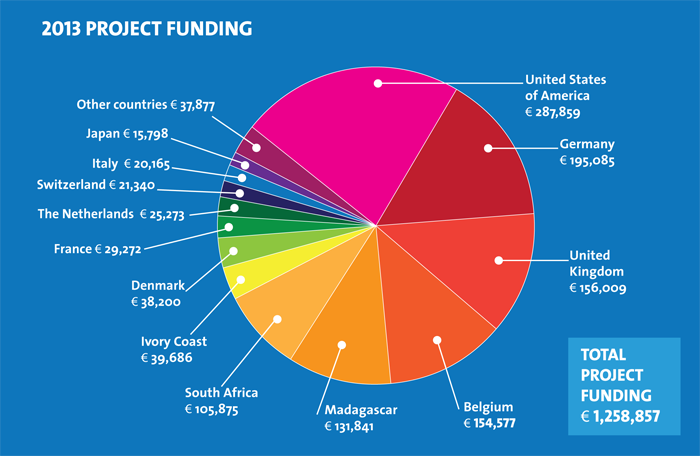 In the first quarter of 2013, the Netherlands’ Ministry of Foreign Affairs officially confirmed its institutional funding contribution to ECDPM for the 2013-2016 period1. However, in October 2013 the Minister also called an end to the extended loan agreement that had been at ECDPM’s disposal since its establishment in 19862. 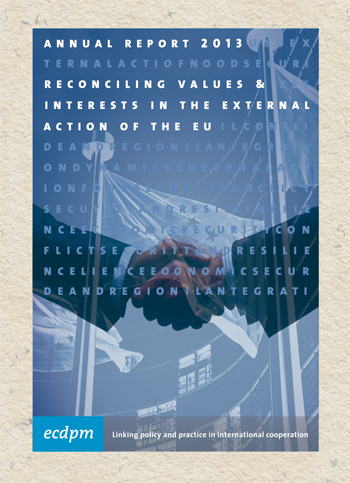 As full compensation was given for the loss of income from interest for the 2014-2016 period, this decision in a sense ‘normalised’ the relationship between ECDPM and the Netherlands’ Ministry of Foreign Affairs into an institutional funding relationship – much like those ECDPM has with other EU member states, though at a substantially higher level. Transparify, an initiative providing a global rating of the financial transparency of think tanks, awarded ECDPM its maximum five-star rating for funding transparency. ECDPM shows ‘exemplary transparency’, according to Transparify, ‘set[ting] the gold standard for the field as a whole’. Transparify believes that transparency boosts the credibility of a think tank’s research findings and policy recommendations. ECDPM continued to be conscious of costs. Operational costs were lower than budgeted, even though demand for our services grew considerably. The efficiency of internal coordination, information management and external communication was increased, most notably through innovative tools developed under the umbrella of the Information and Knowledge Management Exchange (IMAKE) project launched in 2012. Throughout the year, pressure to deliver intensified. We increased deployment of ECDPM programme associates, consultants and additional support hired through employment agencies. The costs of this accounted for almost 61% of our total operational costs. Nonetheless, personnel costs were only slightly higher than budgeted. There was a slight growth in the ECDPM work force as well, to nearly at 51 full-time equivalents. The pressure to deliver was also evidenced by staff not using their holidays as much as in previous years. This tendency was observed with concern by management. Creating conditions for staff flexibility, while keeping up our high-quality performance, will receive particular attention in 2014. The Centre’s infrastructure costs, accommodations, general and administrative expenses, investments and information technology, as well as depreciation and other costs, remained close to budget, with a limited increase of 5.5% in comparison to 2012. 1) Ministry of Foreign Affairs of the Netherlands. Support to ECDPM Strategy 2013-2016. Act no. 24975, 26 February 2013. 2) Ministry of Foreign Affairs of the Netherlands. Termination funding agreement. Act no. 3033, 24 October 2013.